Time Leap – [Auto] (RC) GB1: When this Unit’s attack hits a Vanguard, you can choose 1 of your other rearguards, and time Leap it. The Unit Called from the Deck by this effect is Called to this Unit’s (RC). [Auto]: [Place this Unit into the Soul] When this card is placed in the Bind Zone from (RC), and you have a <Gear Colossus> vanguard, and there are 4 or more cards in your Bind Zone, you can pay the cost. If you do, Counter Charge 1 Card, and if there are 6 or more cards in your Bind Zone, choose 1 card in your Bind Zone, add it to your hand, then choose 1 card from your hand, and Bind it face-up. [Auto]: During a batle in which your <Gear Colossus> Vanguard is attacked, when this Unit Intercepts, search your Deck for 1 <Zodiac Time Beast>, Bind it face-up, then shuffle your Deck. If you Bound 1 card, during that battle, this Unit gains Shield+5000. Auto (VC) 1/Turn GB2 [Soul Blast 1 Card & Choose 1 of your Grade 2 or less Guardians, Bind it face-up]: During a battle in which your opponent’s Vanguard attacks, when your Unit is placed in (GC), you can pay the cost. If you do so, during that battle, this Unit gains Power+15000. Auto (VC) GB1: [Counter Blast 1 & Choose 1 card from your Drop Zone, Bind it face-up] When your turn ends, you can pay the cost. If you pay it, Soul Charge 1 Card, Choose 1 of your Rearguards, Bind it face-up. If you Bound it, your opponent chooses 1 of their Rearguards, and places it on the bottom of their Deck. 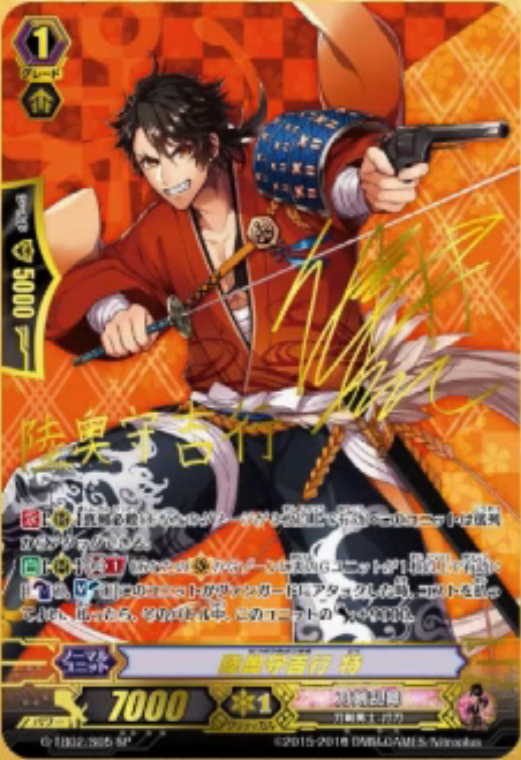 Note: This card’s name has the idiom of 全身全霊, Zenshin Zenrei, “Putting one’s Heart and Soul” into a thing. Complete devotion. [Auto] (RC) GB1: [Counter Blast 1, Soul Blast 1] When this Unit attacks a Vanguard, you can pay the cost. During that battle, this Unit gains Power+9000. [Auto] (VC): [Counter Blast 1 Card] During your Turn, when your G Unit [Strides], you can pay the cost. If you do, look at the top of your Deck, place it on the top or bottom of your Deck, draw 1 card, then Soul Charge 1 card.